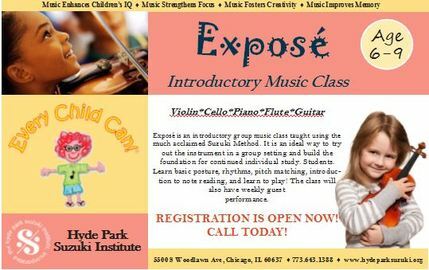 Exposé is an introductory group music class offered to students at our Community Partnership Schools. This class is taught using the much acclaimed Suzuki Method. It is an ideal way to try out the instrument in a group setting and build the foundation for continued individual study. Students. Learn basic posture, rhythms, pitch matching, introduction to note reading, and learn to play! This class will not be offered for the Winter Term 2019. Please check back at a later time or check in with our office for more information.